By far his highest profile campaign surrogate, Hillary Clinton's widespread popularity may indeed help McAuliffe to put it away next week. And more than a few DC journalists have reported that the McAuliffe '13 campaign serves the dual purpose of being a test run Hillary's old inner circle. A.P. photo. For anyone trying to get a handle on the state of the Virginia Governor's race with just a week to go, today was not the best day to tune in. No less than SIX polling firms have released new numbers since Tuesday, all without a lot in common. Though one overiding theme is present in all of them: Ken Cuccinelli is losing. The Democrat leads by anywhere from a 4-pt to 15-pt spread, with McAuliffe ranging between 42-51% of the vote, Cuccinelli 33-41%, and Sarvis 8-12%. So take your pick, right? The problem for Republicans, however, is no matter how you mix and match those polling numbers, there just isn't a winning scenario for Ken Cuccinelli. McAuliffe's worst performance (42% in the Hampton poll) is still better than Cuccinelli's best (41% in the Quinnipiac poll). Digressing back to the recent poll variation; the trajectory of the race is hard to decipher not simply because of the topline result, but because of divergent trendlines as well. The Washington Post and Roanoke College polls seem to think the ground is crumbling beneath the Republican nominee. In mid-September, McAuliffe led Cuccinelli 47-39%. That lead grew to 51-39% five weeks later. Roanoke found a similar trend, though to a greater extent. Just 3 weeks ago, the local Virginia pollster found the Democrat up against the Republican and Libertarian, 41-36-9%. He's now at 48-33-10%. In what has become typical of the controversial Democratic polling firm, PPP, (see their surveys post Newtown shooting, post failed-immigration-reform, post government shutdown) they're out with new numbers illustrating how Democrats have been able to capitalize on the latest drama being played out in D.C. According to pollster Tom Jensen, Kentucky likely voters are furious over the government shutdown, and "taking it out on Mitch McConnell," the Senate minority leader. Though looking at the numbers themselves, it's still not entirely apparent what evidence he is basing his conclusion on. It can't be the topline result, which shows Democrat Alison Lundergan Grimes leading Mitch McConnell, 45-43%. That's because their previous poll, taken months before the shutdown, found nearly the same thing. To Jensen's credit, Kentucky voters disapprove strongly of the government shutdown (60-32%), and also claim they'd be less willing (48%), rather than more willing (34%), to support a candidate who supported the government shutdown. But outside of those findings, McConnell doesn't appear to have been harmed by recent events in Washington - not even when PPP asks respondents who they'd vote for, knowing Mitch McConnell supported the shutdown (the result is unchanged, with Grimes maintaining 47-45% lead). Besides the misleading memo, the PPP survey looks sound in terms of demographic findings, at least compared to the last midterm election. Whites make up the overwhelming proportion of the electorate, with older voters being over-represented in comparison to the general population. But one data point stands out for diverging remarkably from past Senate results: self-identified partisan identification. At the time the poll was conducted, PPP found 53% of likely 2014 Senate voters calling themselves Democrats, with only 37% identifying as Republican (11% identifed as Independent). Put another way, Democrats hold a 16-pt party I.D. advantage over Republicans (matching the party's advantage in deep blue states like Vermont, California, New Jersey, and Illinois). It's that advantage that explains how McConnell trails Grimes overall, despite winning more of his own base, more crossover support from the opposing party, AND more Independents. Conservative heavyweights that you wouldn't expect to see campaigning for Republicans in blue New Jersey, like Rick Perry, Rand Paul, and Sarah Palin, began descending on the state in mid-September, about the same time Lonegan's polling rise began. From left to right, photo courtesy of John Munson/The Star-Ledger, Ruby Cramer/Buzzfeed, and Julio Cortez/A.P. The New Jersey special Senate election set by Governor Chris Chrstie last spring for a random weekday in October is finally upon us. And if you're the Booker campaign, you're probably thanking your lucky stars it's over. If you're the Lonegan campaign, you're wishing there was more time. That's because the trajectory in the special Senate race is clear: Republican Steve Lonegan has cut his initial deficit against Cory Booker in half. Fortunately for Booker, his initial lead was substantial enough (about 20-22 points, according to Huffington Post Pollster) to sustain a fall. With the race coming to a close, he now leads an average 52-41%. Today alone, with 48 hours remaining before polls close in New Jersey, two new surveys have been released, with Monmouth giving Steve Lonegan his best result to date (52-42%), while Rutgers-Eagleton finds Cory Booker winning by a landslide 58-36%. Monmouth University has released four surveys on the special New Jersey Senate race since June, with Lonegan making steady progress in each (from Booker +16, to +16, to +13, to +10 now). 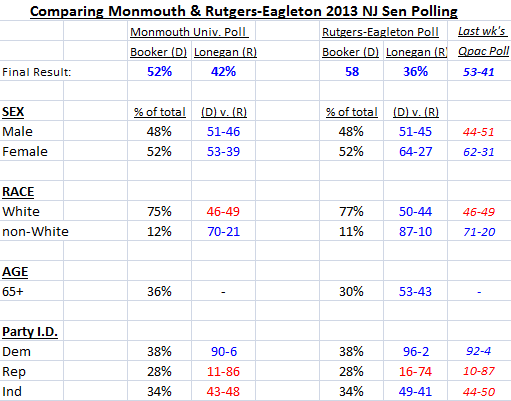 Rutgers-Eagleton's two surveys on the race agree with Monmouth in finding Lonegan making gains since September, though Booker's lead over Lonegan was always much more formidable according to their numbers (from +35 to +22 now). For the record, recent polls from Stockton University, Rasmussen, and Quinnipiac tend to line-up more with Monthouth's latest overall finding. Gallup analysis confirms a long-running trend of Republicans being more harsh on their own party than Democrats with theirs, and points the blame at "internal strife." If there is any "strife," it exists between the groups represented above, with (from left) Demint, Cruz, and Limbaugh representing the Tea Party/Heritage wing of the party, and Boehner, Peter King, and Karl Rove representing the "GOP Establishment." Photos courtesy of Donkey Hotey. Twitter lit up once again this afternoon when the Gallup organization released an attention-grabbing headline: Republican Party Favorability Sinks to All-Time Low. And below is just a small sample of reactions to the news. I'm not surprised the Republican Party is unpopular. It's almost like they're TRYING to be. for all the pundits who've claimed GOP losing the House was a Pipe Dream, care to weigh following GOP's historically awful polling? How bad could it possibly be, you ask? Precedent-setting awful, that's how bad. Barely over one-quarter of Americans have a favorable view of the Grand Ole Party (28%), while roughly two-thirds view it unfavorably (62%). And as Andrew Dugan of the Gallup organization notes, it's the lowest popularity rating for Republicans OR Democrats since they began polling the question twenty-one years ago. For their part, the Democrats are also near-record setting popularity lows (43/49%). They just have a much higher floor than Republicans. "Self-identified Republicans are more than twice as likely to view their own party unfavorably (27%) as Democrats are to see their own party unfavorably (13%). . . These findings may be consistent with the widely circulated narrative that the Republican Party is internally splintered on how best to handle the budgetary negotiations." *denotes survey asked poll respondents whether they approved or disapproved of the Republican or Democratic Party, rather than whether they felt favorably or unfavorably toward the party. In some political parties, the desire to win trumps old disagreements, which must be the case for Charlie Crist's success with Florida Democrats in recent polls. But expect Rick Scott's team to play-up past associations like the ones above (a campaign appearance with Palin in 2008, then Obama four years later) to highlight Crist as a political chameleon. The current state of Florida politics would be entirely unrecognizable to a to a time-traveling political observer from the year 2006. Then, a popular politician named Charlie Crist looked like a rising Republican star who drew barbs from Democrats rather than adoration. In fact, he performed down-right poorly among traditional Democratic voting blocks in his successful gubernatorial run, winning just 14% of self-identified Democrats, 21% of liberals, and 18% of African Americans. Flash forward through a bitter 2010 Senate primary campaign against Marco Rubio (which, rather than lose embarrassingly, Crist withdrew from), a failed Independent bid for US Senate, and a speaking slot at the 2012 DNC, to the man who will again seek the seat he abandoned for Washington D.C., this time as a Democrat. And Democrats seem entirely willing to welcome him into the fold. 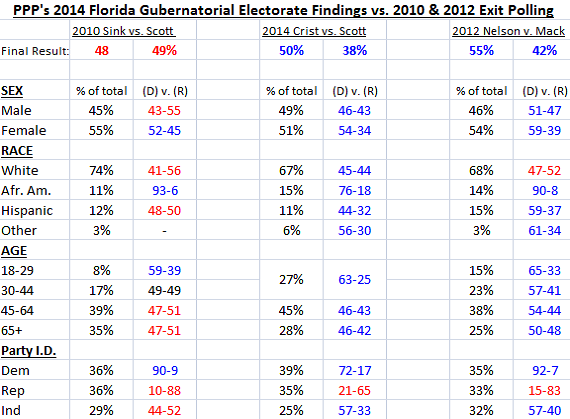 In a recent survey, Crist attracts 85% of the Democratic vote against incumbent Republican Governor Rick Scott. He garners over 80% of liberals, and over three-quarters of African Americans - literally, the polar opposite of the coalition he built to defeat Democrat Jim Davis in 2006. And lest you think Democrats are simply flocking to Crist as the lesser of two evils between he and Gov. Scott, he's killing it in a match-up with his only announced competitor among likely Democratic Primary voters, 59-16%. 62% of Democrats view him favorably, as compared to 43% of ALL likely Florida voters. The sitting Governor's political evolution may not be nearly as complicated as Charlie Crist's, but his current political standing is in much more dire straits. Unlike Crist in 2006, Scott was never elected with a real mandate from Floridians - he defeated his Democratic opponent Alex Sink just 48.9 - 47.7% in what was otherwise a wave-Republican election year. He's suffered from uniquely poor job approval ratings his entire term in office, and currently sits at 33/55% per PPP, leading their President, Dean Debnam, to label Scott "one of the most unpopular Governors in the country. . . "
Based on his head-to-head numbers against Charlie Crist, he's also one of the most at risk of losing his seat, trailing 50-38% in the most recent poll. And the bad news runs deeper than the top line. Pull back the curtains of the PPP survey, and you'll see that women and men, young and old, black, white, and Latino - virtually every demographic & political group surveyed prefers Crist over Scott. And despite what the information in the chart below might suggest, no, it isn't because PPP finds a much more racially diverse electorate than the one that turned out in 2010 (and in some ways, 2012). The 10-month Senator from Texas has made quite the stir in the last few weeks, much to the chagrin of the GOP Establishment upper-brass, yet to the delight of the conservative grassroots. Conducting a 21-hour Senate filibuster can do that to you. And whether by calculated design or not, Cruz has gotten the attention of Republican primary voters, at least according to a recent Public Policy Polling Survey. In a crowded field of 9 candidates, he manages 20% of the vote, good enough for first place over Rand Paul's 17%, and eight points better than his performance in PPP's last 2016 poll. Indeed, Cruz's rise has been a fast one, if you buy PPP's numbers. After debuting in their GOP primary polling in mid May at 7% (good enough for 6th place in a 9 candidate field), he jumped to 12% in July. And for the third survey in a row, Cruz gained again, settling at his current 20%. At that rate, Cruz could be well on his way to a third of the primary vote within the next couple months. Of course, PPP has featured an array of GOP primary leaders since starting their 2016 polling last year (Christie, Rubio, and Rand Paul have all led in the survey at some point), and Cruz's rise may be as temporary as some of theirs. But one thing is for sure: the more self-identified "very conservative" voters showing up in 2016 GOP primary polling, the better for Ted Cruz. Why is that? Because he's performing really well among this segment of Republican primary voters. He picks up 34%, the largest percentage obtained by any potential 2016 GOP candidate polled by PPP to date (Marco Rubio won 29% of 'very conservative voters' in a January survey). Not only that, but Cruz towers above the rest of the field in this category, leaving Rand Paul and Paul Ryan far behind in 2nd and third place with 17% and 12%, respectively. At the time the poll was taken, 'very conservative' respondents made up the largest block of Republican primary voters. In fact, conservative voters in general haven't dropped below 74% of primary voters in a PPP poll yet. Congress, the President, Democrats, Republicans...EVERYONE was better liked by the public during the 1995 government shutdown. New polling indicates Americans are more short-tempered than they wee 18 years ago. At least eighteen times since 1976, according to Wikipedia. In fact, George W. Bush has the praiseworthy distinction of being the only President since Gerald Ford to avoid a government shutdown during his time in office. But most of those shutdowns garnered light interest from public opinion pollsters, scant attention from the political press, and were generally far less glamorous than the one that took place between the Republican Congress and Democratic President in the 1990s, and the one happening now. There's been a wealth of excellent articles written over the last week by TNR's Nate Cohn, Sean Trende of Real Clear Politics, and Harry Enten of The Guardian, regarding the polling differences between the two shutdowns. Enten blew a hole in the mythology surrounding the '95 stalemate, suggesting the 1996 election results were more the consequence of economic fundamentals than the budget showdown. Cohn piggy-backed off this days later, arguing that the GOP's hold on the House of Representatives is unlikely to change in light of events following '95. Trende set out to distinguish the tactics and goals of the '95 battle with today's. This post intends to dive further into the data points driving these three mens' pieces, with a focus on the comparison of public blame then and now, Presidential and Congressional approval, generic Congressional ballot polling, and more. Enten noted in The Guardian the marked difference in the level of blame the public placed on the political parties in '95 and now. Sure, Republicans are again on the receiving end of most of the finger pointing, but not to the extent they once were. In fact, the Republicans most favorable data point out of shutdown polling to date comes from a week-old Pew Research survey finding American adults would blame Republicans in Congress only slightly more than the Obama Administration in the event of an actual shutdown. The Global Strategy Group Poll listed Barack Obama and Congressional Democrats as separate question responses, unlike the other three pollsters who grouped the President with Congressional Democrats into one response. In the 6 surveys that specifically asked about blame for a potential shutdown since the start of September, 43% on average have blamed Republicans, 36% have blamed Democrats. But that's still good news for the GOP, at least from a purely comparative standpoint. 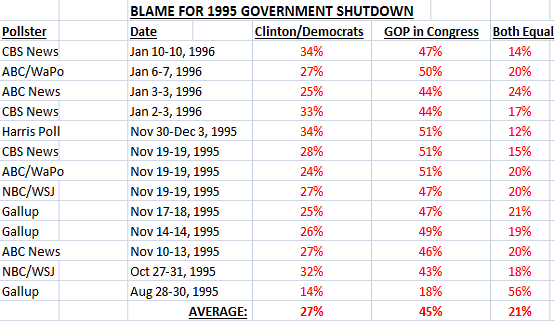 In the weeks leading up to the 1995 government shutdown, (which occurred initially on November 14, 1995), well over two-thirds of Americans (39%) blamed the newly-elected Republican Congress for the deadlock, while just a quarter blamed President Clinton and the Democrats (25%); making the Republican's average "margin of blame" 7 points smaller in 2013 than in 1995. So where should you expect public sentiment to go now that the shutdown is underway? It's hard to say. Immediate media reaction has been overwhelmingly negative for Republicans. Though as Day 2 came to a close, right-wing media, powered by Fox News and The Drudge Report, had been moderately successful at shifting focus to the White House's refusal to sign House-passed appropriations bills that would fund the National Institute of Health, Veterans Affairs, and national parks. Presidential election results by congressional district. Trump vs. Rubio vs. Cruz In The Electoral College - Who Beats Clinton?